The idea of No More Enemies belongs to everyone on the planet. It’s a simple idea, really – but it could change our entire world. The idea is that the concept of “enemies” is obsolete, that it does not serve humanity any more, that it has become very destructive, that it should be retired. The evidence is out there in plain sight… we just have to connect the dots. There are many signs, from many directions, that the old enemies-oriented worldview is being displaced by emergent new paradigms of partnership, shared responsibility, and co-evolving. This shift is made possible and made easier by the new global Internetwork of communication. “No More Enemies” unfolds for you dozens of doorways into this idea – whoever you are, wherever you are. Please think of the book as a personal invitation meant for you. The No More Enemies train is rolling now – hop on board! Read about the idea from multiple perspectives. Think about it and consider its implications. Share your thoughts with your friends. Once you embrace the idea, you own it! The new post-enemies era belongs to everyone. It’s an era of hope and challenge and renewal. *Deb Reich is a writer and translator in Israel/Palestine. She has lived in New York, Wadi Ara, Abu Ghosh, Karkur, Wahat al-Salam/Neve Shalom and Jerusalem, among other places. 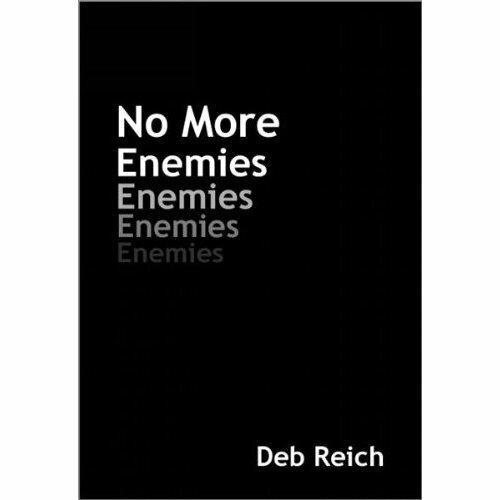 ‘No More Enemies’, yes. Novel notion. Sort of like imaginary borders. After all is said and done, after the bombs are dropped, the dust clears from those pesky humanitarian interventions, well, every last person on this here world bleeds red. Would be nice to stem the bleeding for at least a little while. Live and let live. No more enermies when they have been deafeted, too. or say just one, can you guess which?